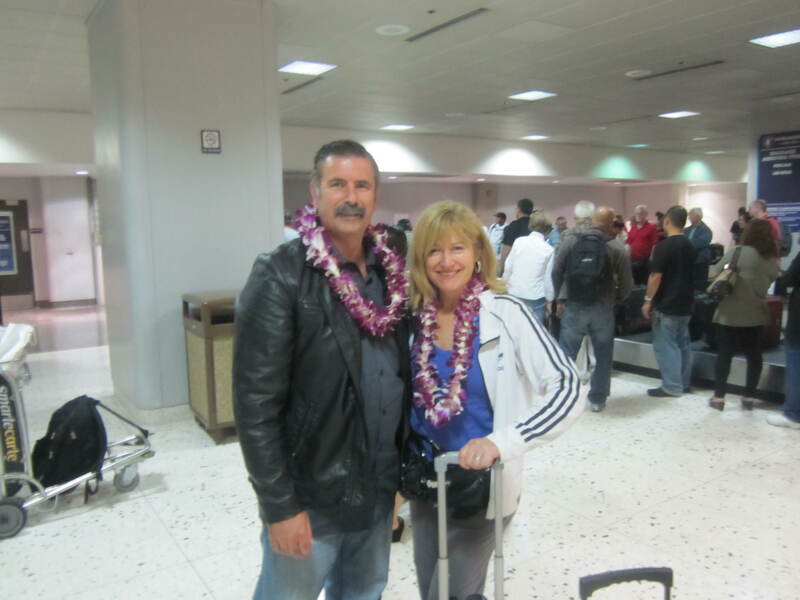 When we arrived at Honolulu Airport, we had transfers arranged for us by our friendly Jet Set travel agent, Peter Scott from Belgrave. The man holding up our name on a sign gave us a beautiful lei made with purple flowers, a nice welcome that probably had the ulterior motive of being able to keep tabs on us while we collected our luggage from the carousel. I made the usual comment about “getting lei’d at the airport” and when Dutchy gave me his lei it meant that I had been lei’d twice. Apparently we were waiting for a group of lei’dies from Australia, but they were de’leied. Is that like deflowering? I think it happened many years ago in their case. We were driven to the Outrigger Luana Waikiki by “cousin Barry” who was quite amusing, and happy to accept tips. 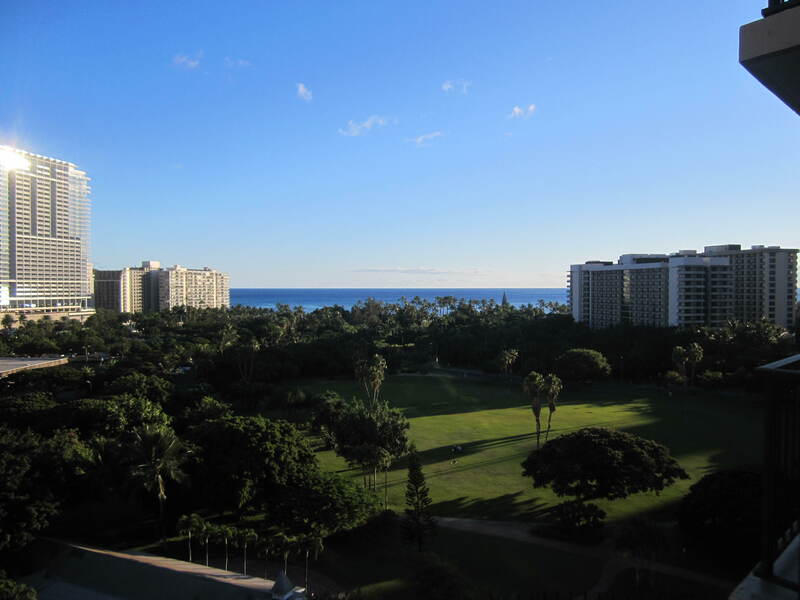 Our hotel overlooked Ainahau Triangle and Fort Derussy Beach Park, and we settled in fairly quickly. However, as soon as I open my suitcase it virtually explodes. Even staying anywhere for one night, I open it up and it springs to life like a jack-in-the-box. Dutchy decided to hang up his suit but I wondered why he bothered, just for one night. “I’ve been hanging it up everywhere we go, so I’m not going to stop now,” he retorted. The hotel was really nice and comfortable, and I liked the kitchenette idea. It contained an in-room safe and a fridge – excellent. I loved the balcony also. There was free in-room wi-fi, hooray, which after travelling this time is definitely on my list of essentials. Tiled floors helped keep the room cool, though it didn’t lend itself to Body Balance, but there was a Fitness Centre included. 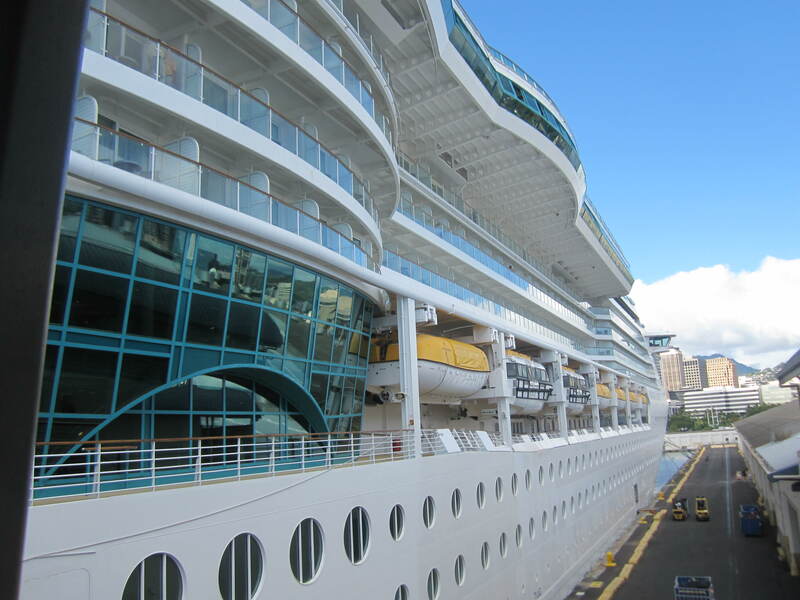 It was almost a pity we were not staying longer, but the cruise beckoned. For breakfast I had ducked out to buy some fruit and yoghurt, as we knew we would be having plenty to eat over the next 17 days, and even managed some gym and a bubble bath before our noon checkout. Dutchy asked where the souvenir photos from Las Vegas were, but they were not in my silver bag, nor in his new cabin trolley case. Eventually we found them, tucked in flat in another bag, but my stomach had sunk when I thought the hunky photo of Dutchy had disappeared. Another service offered by the Outrigger Luana was printing boarding passes for free, and storing luggage, both of which we utilised. This is when we found out that, unlike the 8.59pm boarding time listed, we could actually board at 1.30pm. However, we wanted to go for a walk to get some supplies, such as batteries for our little travel speakers, sunscreen, insect repellent, headache tablets and toothpaste. We also bought Dutchy a nice royal blue Hawaii singlet top. We took a taxi to Pier 2 for a cost of $20, arriving by about 3.15pm, where there was no waiting. 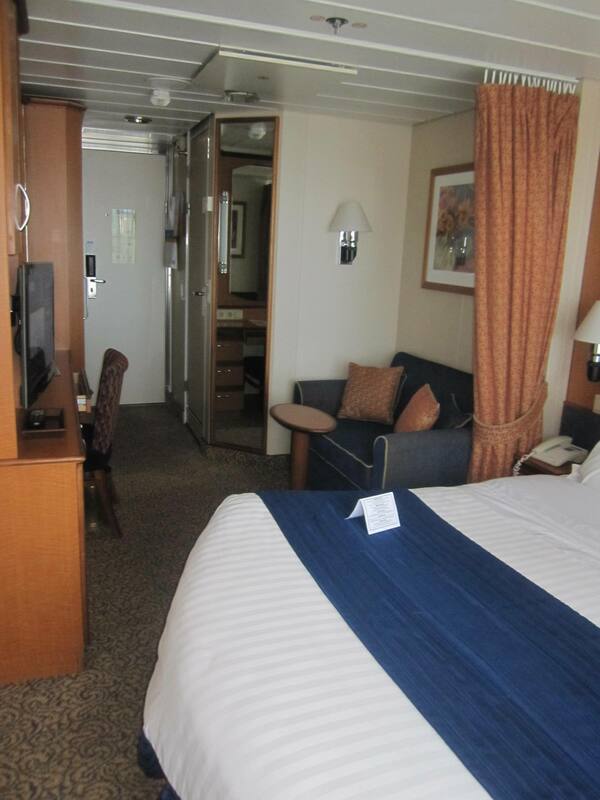 We made it smoothly into our room number 7532, which turned out to have a larger balcony than others. We’re not sure if we paid extra for that, but it’s certainly worth it. Our main bags had been put through the X-ray machine, and we had told them we had a bottle of duty-free Bourbon in the case. All the literature about the cruise had warned that anyone trying to smuggle in alcohol would have it confiscated, so we weren’t going to take any chances. Unpacking had to be done, with the lovely knowledge that we needn’t live out of, or pack and unpack, a suitcase for seventeen nights! I started first, but then I got tired of the chore because I had so much stuff, so it was Dutchy’s turn for a while. That’s when he had the sudden realisation, after opening his suitcase, that he had left the suitbag in the hotel! This necessitated a mad reconnaissance to retrieve it. 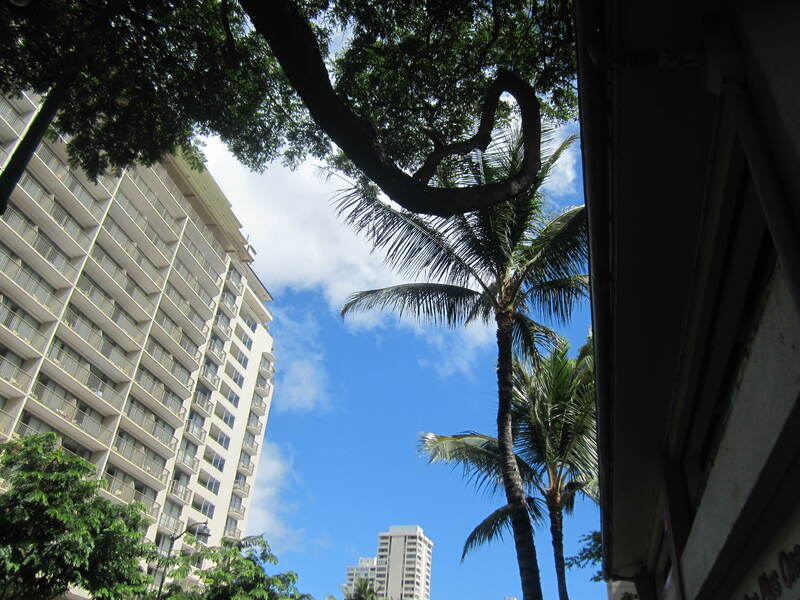 He had to go back to Waikiki, ending up costing $35 in taxi fares and stressing him out. 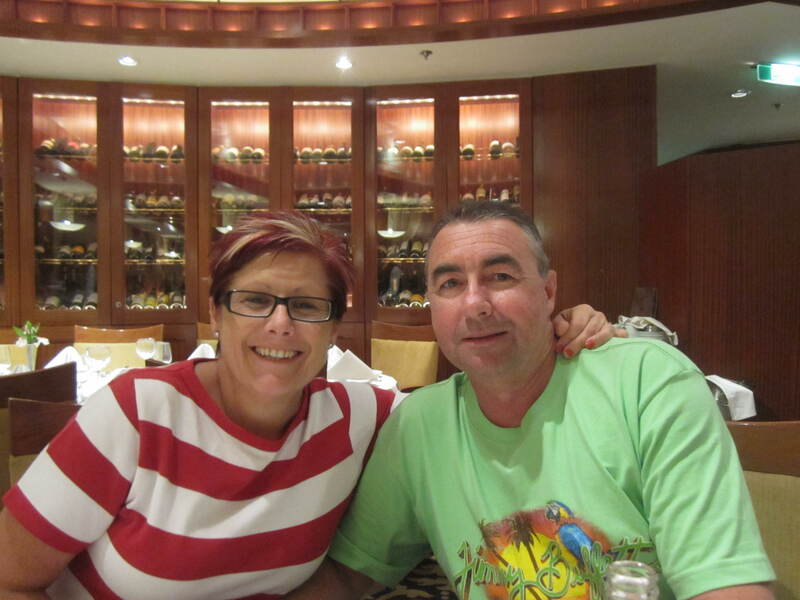 It left me having to go to dinner alone, but at least we were meeting up with our friends, Sandy and Mick, whom we had met in Phuket in 2008, plus meeting the other three couples they were travelling with. He finally arrived, with a story about locating the suit bag, and needing a drink right away. We were quite relieved, because had we boarded at the original time stated, 8.59pm, we would have had no hope, as everyone had to be on board by ninety minutes prior to sailing. 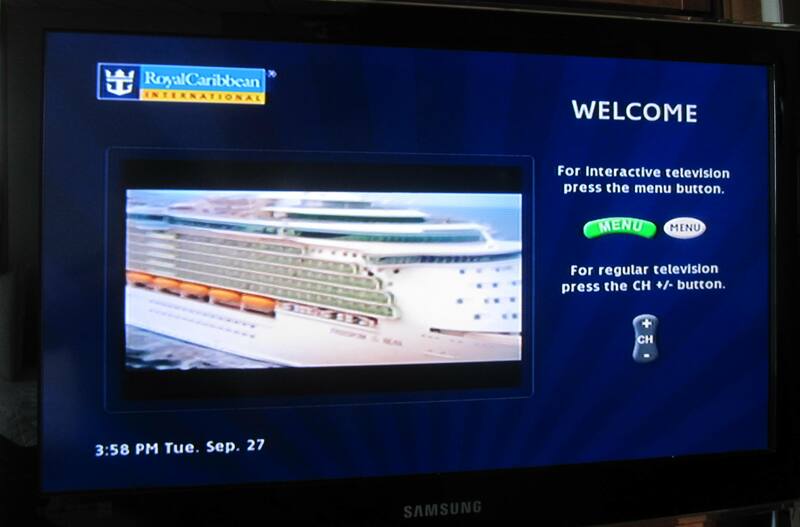 So despite the smooth transition into our room, it ended up rather a dramatic start to the cruise. 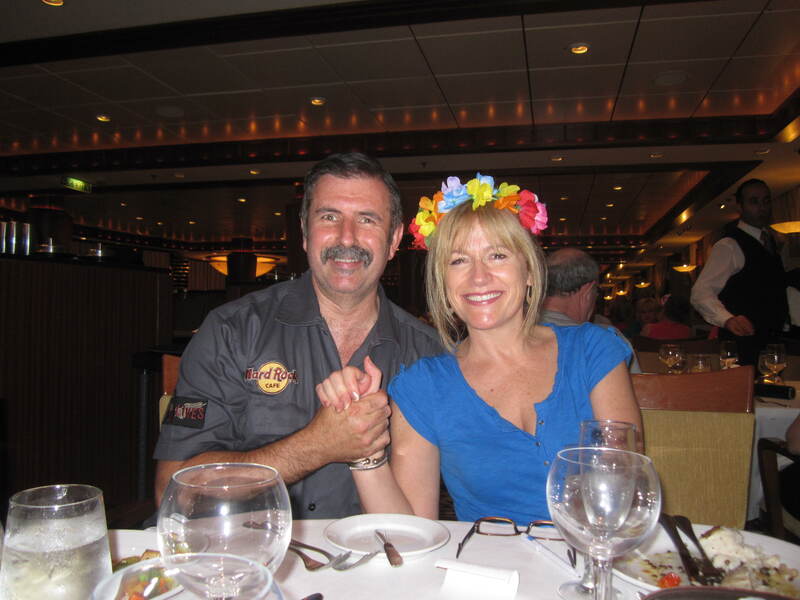 This entry was posted in Royal Caribbean International Cruise and tagged jet set travel, luggage, outrigger luana waikiki, radiance of the seas, Royal Caribbean cruise, stateroom. Bookmark the permalink.